Woah!!! 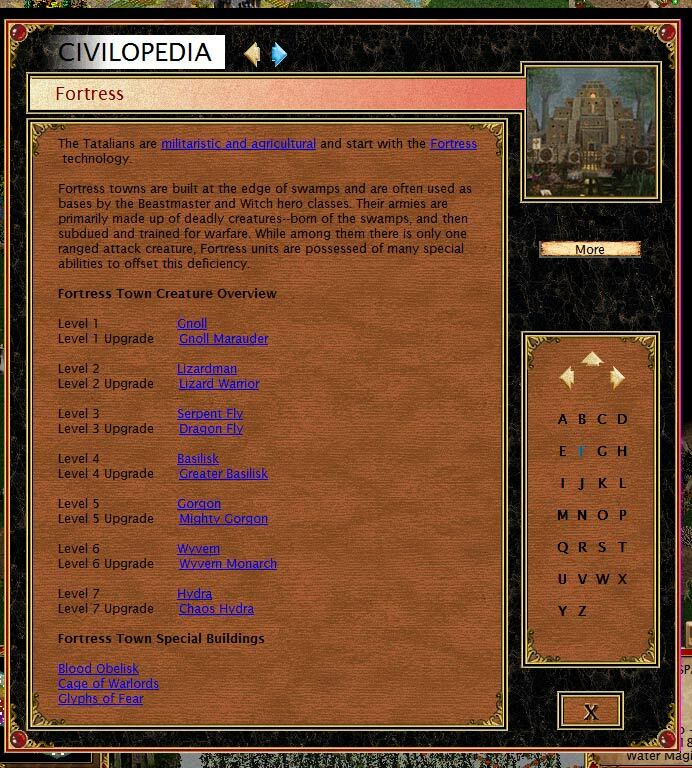 I'm a huge Civ and HoMM series fan so how the hell did I not know about this lol!!! I couldn't find any threads about this here so I'm guessing maybe none of you guys know about this either. Might be worth a mention on the main news page @Pol and @Karmakeld ! 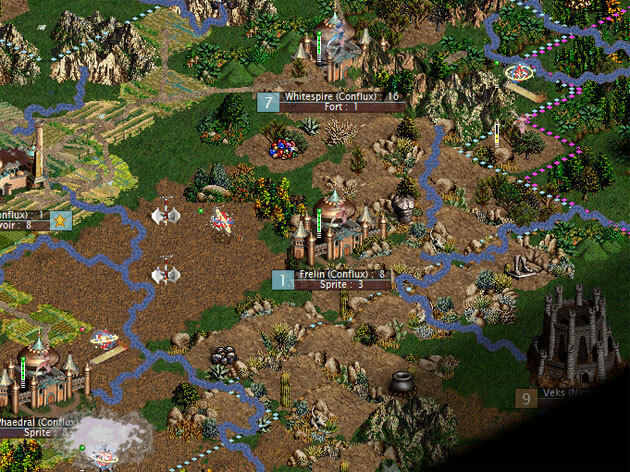 Either way I'll have to add this to my HoMM Similar Games & Big Mods List . 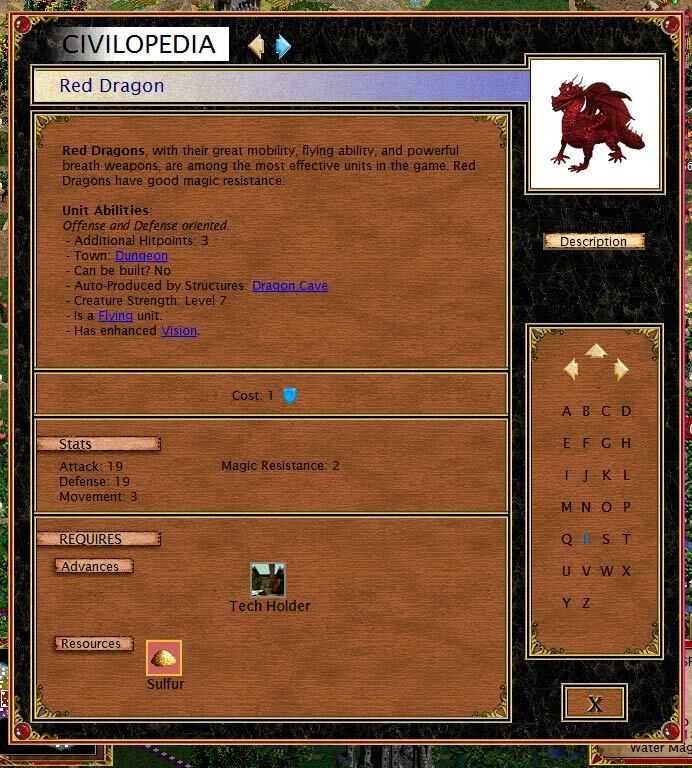 This guy has completely converted Civilization 3's UI, graphics, units, techs, factions etc to be in the Heroes of Might and Magic universe. Looks like he's gone in a very HoMM3 direction (with a bit of HoMM4) which is cool. 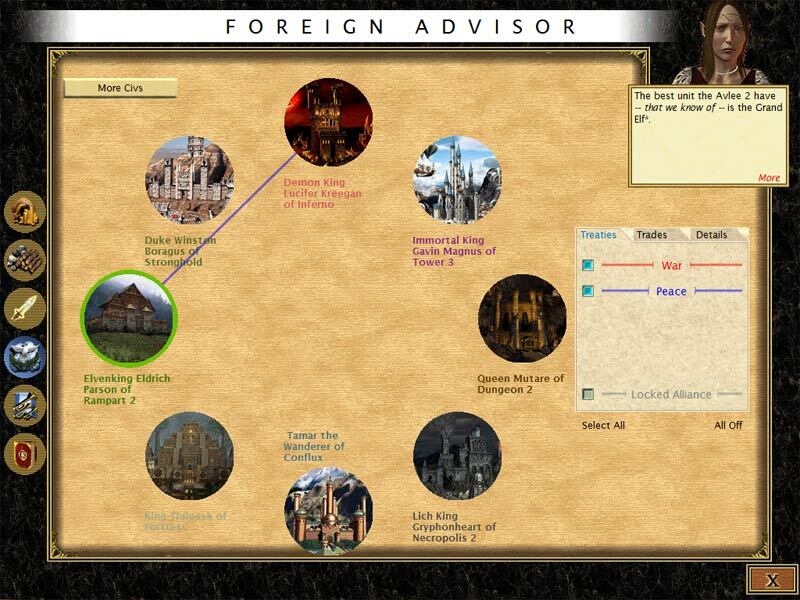 I've mucked around with a few Civ3 mods in my time and I've never seen so many elements changed so much. He's even got HoMM3 unit upgrades in there lol! Obviously being a Civ game we're not going to get zoomed in combat but his mod allows for some very fun situations eg being able to colonize/make new cities, farm the lands and expand all over huge worlds effectively carving out your own story. 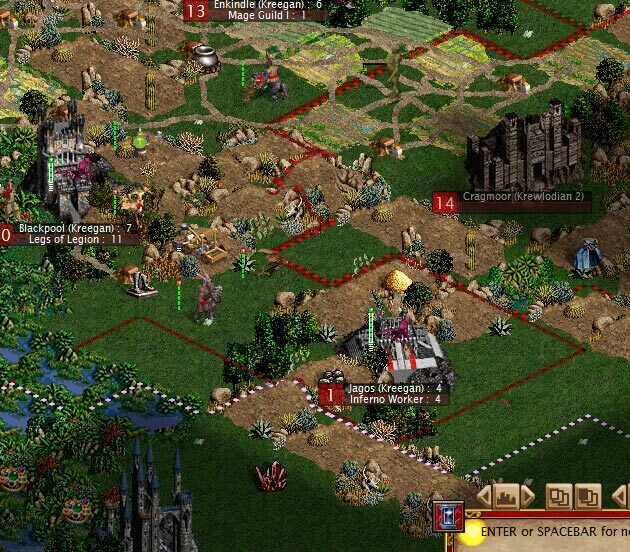 Basically a more sandboxy global HoMM3 haha! Annoyingly most of his picture links are dead but thankfully I found some working one's which I'll stick below. I don't think he's working on it anymore however from the sound of things in his thread he's actually finished it! If he still visits CivFanatics I might try and talk him into making a ModDB page. I've just downloaded ti and will try it soon and let you guys know how it plays. Looks like its installation is a bit of a nightmare grr. 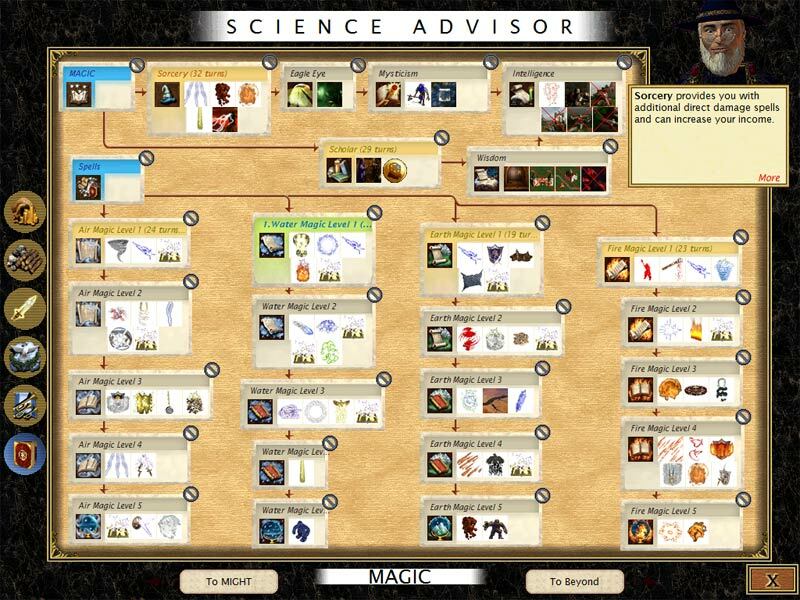 A huge variety of spells (converted from HoMM3) are also included, as well as many additional misc graphics. Castle - Castles are home to the Cleric and Knight hero classes. Castle armies are primarily composed of human men-at-arms, though these towns have also formed an alliance with the griffins and are under the protection of angels. With two types of ranged attack units and two flying unit types available, Castle-based armies are well equipped to quickly engage and defeat their enemies. Inferno - Inferno towns can be found in Erathian regions blighted by the emergence of the underworld on the surface. Demoniac and Heretic heroes stand in uneasy alliance with these towns. Inferno armies have great hand-to-hand attack units and are only slightly hampered at the lower levels by a lack of flying units until the awesome, teleporting devil and arch devil units can be brought into play. Neutrals - Neutral creatures are those that reside in the land of Antagarich whom do not normally belong to a specific town type. The neutral town is the only town capable of building structures that will produce Level 8 and Level 10 creatures. They do not have any special town buildings or a grail structure, but can become a serious threat if left unchecked. Dungeon - Dungeon towns are built by Warlock and Overlord hero types to act as bases from which to wage campaigns of conquest for wealth and power. Similarly minded creatures are attracted as allies. Other Dungeon creatures are in thrall to their masters. Dungeon armies are possessed of a variety of long range attacks, have effective damage dealing troops, and have the ability to greatly disrupt the strategies of their enemies. Conflux - Conflux is the town of the Planeswalkers and Elemental Lords. Nobody knows why they have suddenly decided to appear in this world and assist the humans with Catherine Ironfist in the head to fight Kreegans invasion on Antagarich. The Elemental Lords didn't reveal their reasons, though their help was invaluable and happened to be the decisive factor in the final victory of the humans over the devilish aliens. It was in the war for the fable monstrous Armageddon's Blade that the first sightings of the strange Conflux towns have been reported. Necropolis - Necropolis towns are overrun and ruled by undead creatures. They are natural bases for the Necromancer and Death Knight hero types. 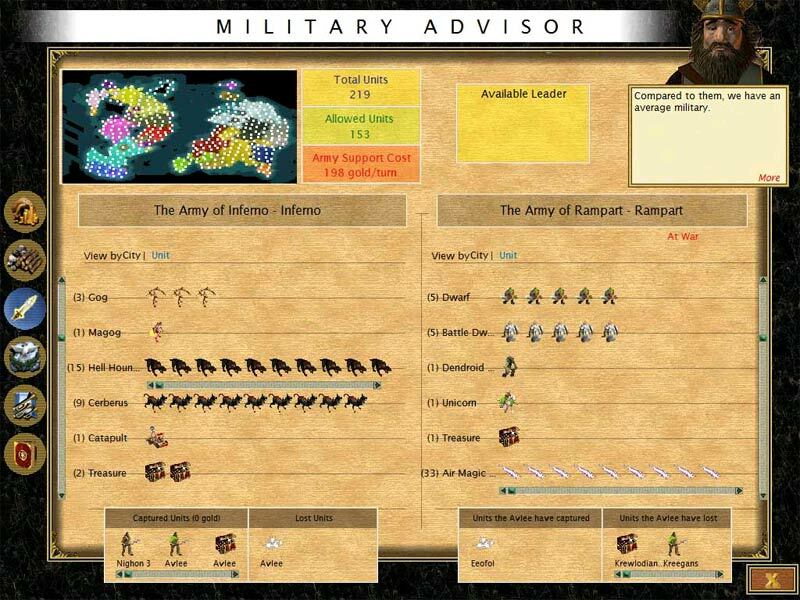 Necropolis armies have many units with abilities to weaken their opponents. One of their greatest strengths is the ability to amass countless numbers of skeletons. This quickly gives them an edge over equal or even more powerful enemy units. Fortress - Fortress towns are built at the edge of swamps and are often used as bases by the Beastmaster and Witch hero classes. Their armies are primarily made up of deadly creatures--born of the swamps, and then subdued and trained for warfare. While among them there is only one ranged attack creature, Fortress units are possessed of many special abilities to offset this deficiency. Tower - Wizards and Alchemists study their arcane craft in Towers. Tower populations are comprised creatures bound into service by powerful magic, made on the spot, or allied with the town through ancient pacts. 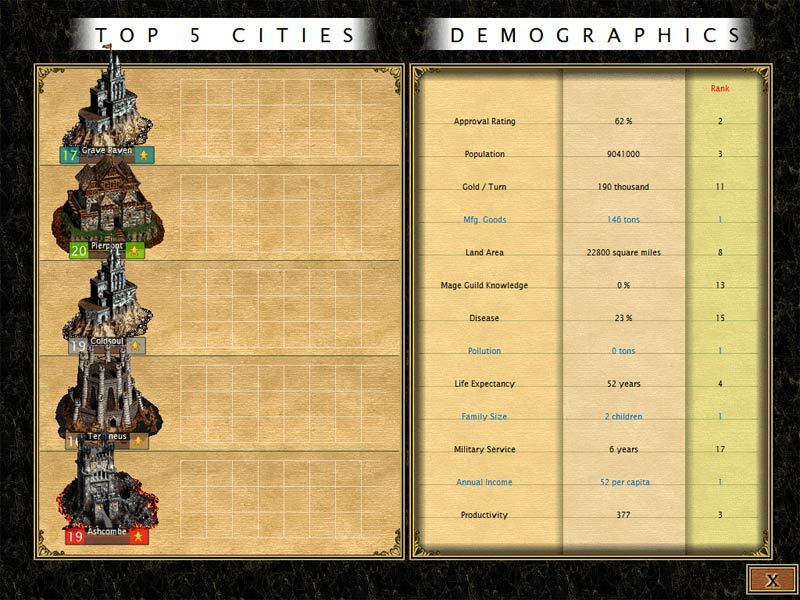 Tower armies have uniformly good stats and some of the best range attack units available. Rampart - The Druid and Ranger hero classes are native to Ramparts, which are built by creatures in allied defense of the unspoiled wilderness regions of Erathia. With two slow unit types, Dwarves and Dendroids, Rampart armies may be best suited to defensive tactics. Most of these creatures, however, have enemy hampering abilities that can be used to turn the tide against many opponents--especially those dependent on magical attacks. Stronghold - Stronghold towns are built by alliances of tribes and are frequented by the Barbarian and Battle Mage hero types. Armies composed of Stronghold-based units have a balanced mix of ranged and hand-to-hand attackers. With the inclusion of the stronger units, these armies are particularly well-equipped to deal with attacks on other towns. That is how far I've gotten in 83 turns. Been building city improvements and doing a small amount of exploring. The borders are from Pounder's Stockade Mark I mod in case you're wondering. mythusmage wrote: After 107 days of my last game I have this bit of advice for folks. 1. Don't build scouts. You have too great a chance of meeting raiding parties and losing the scout. Build combat units instead and let them go exploring. 2. Workers, lots of workers. I'm starting a new game to try out building a lot of workers, so what follows is the sole screen capture for the last game. Last edited by Blake on Feb 24 2019, 13:21, edited 11 times in total. 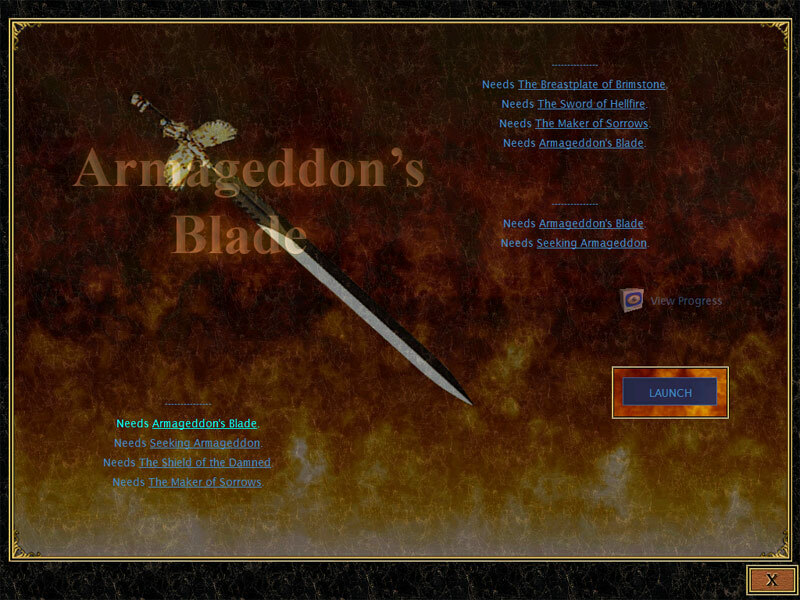 Blake's Sanctum - Heroes of Might & Magic: fan page containing pictures, vids, info, similar games & fan projects! And there it comes, I know that I own Civ III+IV somewhere but they are nowhere to be found. Anyone can take a look a at it? This sounds great, no doubt! I see 2017 all around it. Got Civ III. from GoG, they have it under 2€ now. Download seems valid as well. Last edited by Pol on Feb 24 2019, 23:47, edited 2 times in total. Looks impressive! Although I'm not a Civ player, it's noticeable the amount of work behind all that. 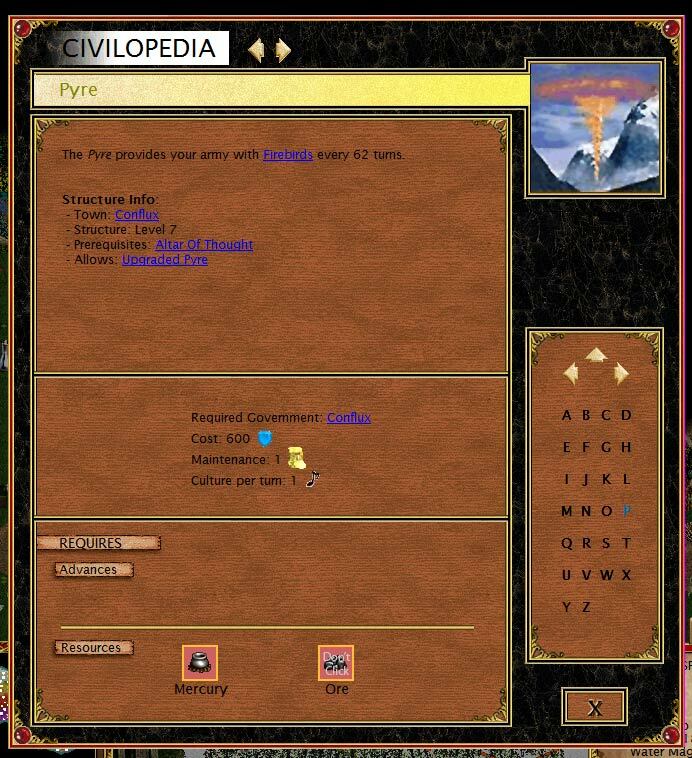 Pol wrote: And there it comes, I know that I own Civ III+IV somewhere but they are nowhere to be found. Anyone can take a look a at it? Yeah it's been inactive since 2017 however like I said above I'm pretty sure it's finished so we don't have to worry about yet another abandoned incomplete mod out there haha. He worked on it for like 10 years using beta numbers and called his final relase version 1.0 so I think we're good! Definitely worthy of being posted in the main news mate. Yeah I couldn't find my old Civ3 Gold cd so I bought it cheap on steam! I'm actually mucking artound with some other mods at the moment so I didn't want to overide my install so I tried an alternative idea that would probably work just fine with the GoG copy too. If you've got plenty of hard drive space to burn then just make a copy of your entire Civ3 install folder and then install the COMM3 mod over the top of that copy. I was able to do it with my steam copy of Civ3. I went into my steamapps common folder and found the 'Sid Meier's Civilization III Complete' folder and hit copy and paste to make a 'Sid Meier's Civilization III Complete - Copy' folder, then followed the COMM3 full install instructions and installed it over the copy install (not the original), if I run the copy conquests exe it whinges about the steam api but the game still starts haha, if you run the COMM3 exe (which you have to for the mod anyway) it appears to bypass steam entirely heh. I'm gonna play the hell out of this in the near future and will prob do a video too! Last edited by Blake on Mar 4 2019, 5:57, edited 4 times in total.